Many citizens in this town steadfastly opposed building New Central, then a weird thing happened on the way up the hill. People soon began to grow fond of the funky, seventies building and fell in love with the spot. And once Duluth citizenry had gotten good with it all, and had become attached, and the bitterness had nearly disappeared, what did our wise school district do? It stirred up all the wrath again by forcing them to abandon New Central. From the beginning, the whole thing struck me as stunningly clumsy from a public relations point of view. All the machinations around the deal were done under the table, without a vote, and the central corridor’s “representative” broke every one of his campaign promises. If the betrayal around Old Central still has staying power after nearly half a century, just think how many decades down the road there is still going to be lingering resentment in Duluth about New Central. On top of the underhanded, undemocratic way the deal was done, a lot of disgust is festering over the result. We were told New Central would be a RED-hot property on the real estate market. The only thing we had to worry about is getting trampled by the stampede of wheeler-dealers waving fistfuls of millions, salivating to get their hands on the place! Five years later, this hot property is still burning in our hands. The place is costing us at least $170,000 a year in maintenance and utilities (already nearing a million dollars, in total, wasted,) and we’ve had vandalism as well. Some of the loss is hard to calculate, because the plan was based on fantasy to begin with. The buildings always had little or no value, except as schools. How do you even depreciate the value of something that for most buyers is nothing but a barrier to purchasing the property, to begin with? We are actually in the potentially untenable position of having to PAY big money (estimated, $1.2 million) to tear down a multi-million building only 45 years old, because the district has been unwilling to sell to another educational organization, and no other developer wants to take on the cost of demolition. “If it (Central) is not going to be used as a college or institutional type facility, it would be best to tear (the building) down and take advantage of the land.” District Facilities Manager, Kerry Lieder, was quoted in the News Tribune, after the last deal to purchase the property fell through. And we’re not just talking about Central. There are two more buildings on the campus: the upper and lower Secondary Tech facilities. Both these buildings are practically new. One was built in ‘95; the other in ‘94. Both were teenagers were they were closed in 2011–fifteen and sixteen years old. The taxpayers still owed $2.3 million in construction bonds, which they were forced to pay off while the buildings sat vacant. Johnson Controls’ Education Adequacy Report praised the secondary tech campus as “a shining example of the breadth and quality of programs offered by Duluth Public Schools. The Center is one reason why the district enjoys a positive open enrollment ratio in the upper grades.” A district suffering perennial enrollment loss tossed out a very popular facility that even the corporate hustlers acknowledged was an enrollment magnet. I’m a slow learner, but I get there. The public was overwhelmingly in favor of selling the Central property to Edison charter school, and at first I thought the public had a chance of winning on this one. By the time I stepped into Old Central to observe our democracy in action, however, I was leaning with almost complete certainty in the opposite direction. The Board called a special meeting on Thursday, March 31st, to decide whether or not to suspend policy prohibiting the sale of property to a competitor. There was no surprise ending to this proceeding. Everything unfolded exactly the way I had come to believe it would: the four Board DFLers voted against the policy suspension. Our leaders, especially one State legislator, have been demagoging Edison’s Board as unaccountable to the public because it’s not elected. I would enjoy hearing anyone attempt to make a credible case that we’ve been faring better with an ELECTED board. The push to reject the sale to Edison was orchestrated almost entirely by district inside players. In a Duluth News Tribune online poll, 84% of the 3513 respondents wanted the district to sell to Edison. Only one real improvement over the way our government has functioned in the boardroom over the past decade was evident during this debate: there wasn’t a blatant attempt to shut one side up. Both sides talked, and talked. The inside players argued that the Board is in place to represent district 709. The outsiders argued that Board members are supposed to represent the taxpayers and the larger public who elected them. The insiders had four Board votes; the outsiders, three. A DFL party operative got quite annoyed when I pointed out that special interest had won again in the boardroom, but to deny the pattern is to deny reality. It was the teacher union’s adamant opposition against the Board approving anything potentially helpful to Edison that carried the day, and the DFL and the unions are wedded. In light of the teacher union’s opposition, I think it is legitimate to question the objectivity of some Board members. The Chair of the Board–Annie Harala–is a district employee and her mom is a teacher. The Clerk–Rosie Loeffler-Kemp–is intimately connected to the unions. Her husband is an AFSME field rep; her daughter is employed with the Duluth Central Labor Body. The public school unionized teachers fear competition from the Charter schools’ nonunion teachers. Duluth public school teachers also fear that ISD 709’s decision to give up the beautiful Central campus is going to come back to bite them. They’re afraid someone else is going to pick up what the public school district foolishly threw away and knock the ball out of the educational park. Bad pun intended, closing Central and the STC center was the Red Plan’s central miscalculation. Denfeld graduated fewer students last year than before we closed Central. Dumping that great campus is one of the primary reasons enrollment has been going south. The public school teachers’ fear has some basis. If Edison had managed to purchase the Central campus, the school may have flourished even more than it is already going to, because–are you listening Red Planners? !–the Duluth community LOVES the Central campus. Edison’s primary objective is to keep the students it already has in it’s K-8 program all the way through high school. The organization plans a gradual build-up to full high-school enrollment. In other words, once they have their school built, they aren’t planning to put up a “Come-on IN!” sign. They plan to first start with a full ninth and partial 10th grade. Adding another grade a year, the goal is to have, after three more years, a complete 9-12 high school program. Based on parent surveys done by the school, Edison anticipates approximately 80% of the 8th graders graduating from its K-8 facility to “matriculate” into its new high school. Last year Edison graduated 119 eighth graders. 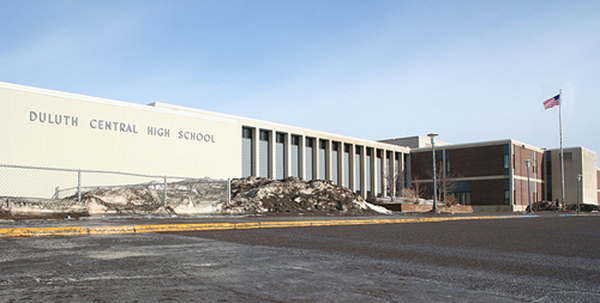 Past data indicates that approximately 67% of its eighth grade graduates (or, about 80 students last year ) have been attending ISD 709’s high schools and the number is pretty evenly divided between East High and Denfeld. I don’t mean to minimize what this loss will do to ISD 709. Over the course of four years, 80 adds up to 320. Just using the current basic per/pupil formula, 320 lost students adds up to $2.25 million in erased State aid. ISD 709 is already bleeding students and losing money every year, so this additional loss is a concern. Edison’s moves, however, normally wouldn’t pose that much of a threat to a large, fiscally healthy district, if reckless decisions hadn’t already led ISD 709 to the edge of the cliff. The $14.2 million dollar question some were asking was: would Edison, in more expansive accommodations, stick to its expansion plan? Edison Board members I spoke to said the organization saw 660-700 students as an optimal high school environment and they had no intention of doing anything that would put their mission in jeopardy. Money, though, always brings up a lot of questions. The most out-of-kilter experience of sitting through the March 31st meeting was listening to the Board majority members downplay the importance of an incredible offer of $14.2 MILLION. To torture my poor pun, selling the property to lower the tax burden was supposed to be a CENTRAL part of the Red Plan! Majority members claimed they were looking out for the taxpayers, by waiting for a buyer who would put the property on the tax rolls. Central has been vacant for five years, losing money, and a developer just backed out of a deal for $10 million, because development costs were too high. It’ll likely cost us a bundle of money (including demolition costs) to make the property sellable to anyone other than an educational organization, and then it’ll just end up in Tax Increment Financing for twenty years. The primary argument against the sale was that Edison, a competitor to Duluth’s public schools, was being given too much for too little, but another very important part of this debate was given short shrift. We, the whole Duluth community, have already spent millions and millions of dollars on three perfectly good buildings and athletic facilities. What an unconscionable loss of our wealth and resource it would be to just demolish everything and haul it off to a landfill! And what about the Red Plan’s “savings”? The primary way money is saved by consolidation is by REDUCING square footage. The district was supposed to reduce space by 500,000 square feet and still has 6296 square feet MORE on its hands than it started with. For years the DFLers in the boardroom and their administrative allies have been blaming the failure to sell property as one of the primary reasons for their budget problems. Now the whole bunch spoke out of the other side of its collective mouth, making the absurd case throughout the evening that a $14.2 MILLION dollar sale wouldn’t really matter all that much to a school district with a $3.3 million deficit and a depleted reserve fund. It felt like Keith Dixon had thrown a big red stone into the middle of a vast dark lake, and ripples of Orwellian doublespeak were still disturbing the surface ten years later. The most cogent argument of the night emanating from the anti-Edison crowd was Board member Sandstad’s point that ISD 709 student body has a significantly larger percentage of homeless kids than Edison. She extrapolated this fact to make the case that the public school district serves more disadvantaged kids. Edison Board members told me that the number of students receiving free and reduced lunch is about the same in both institutions, so I can not say if the “disadvantaged kids” argument is valid, but at the minimum Edison has some pr work to do: there were other arguments suggesting that Charter schools are more elitist and less welcoming. Some minority speakers also expressed concerns about the mission of Charter schools, and complaints were made that Edison is for-profit. For the record, Edison is officially known as Duluth Public Schools Academy and is a nonprofit organization. The school currently contracts with a for-profit company called Edison Learning for bookkeeping services only and plans to dissolve that limited relationship at the end of this fiscal year. Time to wipe this measly $14.2 MILLION offer off the table and again pursue our wonderful (and highly successful) marketing strategies to sell the property! Member Johnston challenged her to “show the evidence” to back up her charge of inaccurate facts being thrown around. Loeffler-Kemp’s accusation wasn’t directed only at a fellow Board member. She suggested a lot of misinformation had been tossed about by the people advocating for the sale. The only tangible example she came up with was that the Edison people said the Central campus had been closed for six years, when it’s been closed just shy of five. Well, this is one thing I can absolutely guarantee: Loeffler-Kemp and her allies are on the road to straighten out this small bit of “misinformation.” The property will definitely sit empty for at least six years now, and the taxpayers of this city will throw away at least a million dollars on maintenance and utilities. He and the other two Board dissenters–Oswald and Johnston–wanted to wait to get a full offer from Edison on the table before the Board voted on whether or not to suspend policy, but the DFLers were having none of it. Art Johnston–who has fought with amazing tenacity against the party machine’s dominance in the boardroom for more than six years–actually became a bit overwhelmed at one point. He had to stop speaking for a few long seconds, and regain his composure. Losing this many times in a row isn’t easy. This loss cuts two ways, though. Stuck in a pattern of more than ten years, a public Board once again failed to represent the majority will of the public. To a lot of people, Edison is looking even better than it did before.